Proverbs, called provribs, freits or sawes in Scots, are short familiar sayings expressing a supposed truth or moral lesson. A bonnie bride is suin buskit, an a short horse is suin wispit. A pretty bride needs little decoration; a small horse little grooming. A cauld needs the ceuk sae muckle the doctor. Nutritious food can cure a cold as effictively as medicine. A fuil an his siller's easy pairtit. A fool can never keep hold of his money. A gaun fit's aye gettin. People already involved acquire more involvement. A greedy gutsie ee ne'er gat a fou wame. Greedy persons are never satisfied. A guid dug ne'er barkit aboot a bane. Good servants don't look for rewards. A guid name's suiner tint nor wun. A good name is sooner lost than gained. A hungersome wame haes nae lugs. A hungry person can't listen to reason. A man o wirds but no o deeds is like a gairden fou wi weeds. A new besson soups clean. A man who lives in a rundown house with a moaning wife will have a life of trouble. A rowin stane gaithers nae fog. A shored tree staunds lang. A skelpit bum braks nae banes. A good spanking never did any harm. A smaw buss is better nor nae bield. A tocherless dame sits lang at hame. A penniless woman will wait a long while before she gets married. A wife is wice eneuch that kens her guidman's breeks frae her ain kirtle. It's a wise wife who leaves her husband in control. Ae man's meat is anither man's pushion. Aboot the muin thare is a broch, the wather will be cauld an roch. A halo around the moon indicates cold an rough weather. Try often and you will occasionally succeed. An ill cou can hae a guid cauf. Good may come from an unpromising source. An ill shearer aye blames his tuils. As ae door's steekit anither appens. As daft as a yett on a windy day. As the day lenthens the cauld strenthens. The cold winter weather comes after the turning of the sun. Old proverbs tell the truth. Auld speugies is ill tae tame. Aw compleen o want o siller but nane o want o mense. If they had more sense they would soon have more money. Aw things haes an end, an a pudden haes twa. All things have an end, and a sausage has two. Aye hae yer cog oot whan it rains kail. Seize every chance that presents itself. Aye tae eild but niver tae wit. Always growing older but never wiser. Bairns maun creep or thay gang. Beauty's muck whan honour's tint. Beauty is of no value when honour is lost. Better a fremmit freend nor a freend fremmit. Better friendly stranger than a friend estranged. Better a moose in the pat nor nae flesh. Better a tuim hoose nor an ill tenant. Better a wee buss nor nae bield. Better hauf an egg nor a tuim dowp. Better half a loaf than no bread. Better ma freends thinks me fremmit as fashious. Better my that friends think me a stranger owing to infrequent visits than troublesome owing to too many. Better mak yer feet yer freends. Show a clean pair of heels. Better weir shuin than sheets. Sick men wear sheets and sound men shoes. 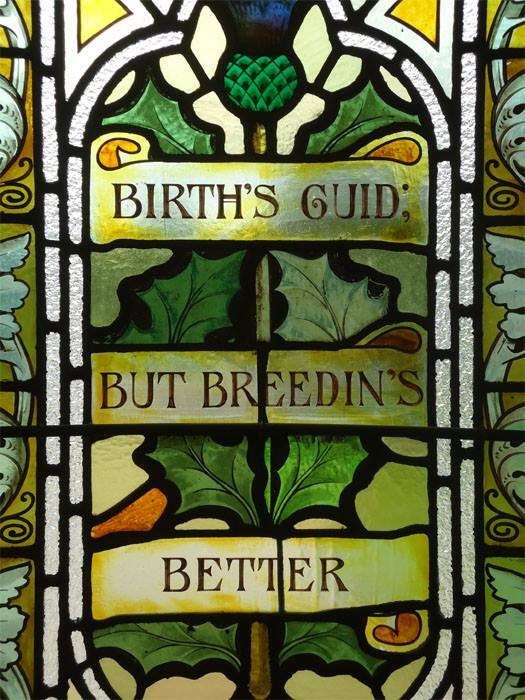 Birth's guid but breedin's better. A noble birth is good but good manners are better. Craft maun hae claes but suith gangs nakit. Cunning must have clothes but truth goes naked. Dinna lat the bunnets gang by waitin for the hats. Don't be so choosy and completely miss your chance. Dinna speak o raip til a chield that's faither wis hingit. Don't talk of rope to a man whose father was hanged. Early creuk the tree that guid crummock wad be. Eat the cou an wirry on the tail. Fail in one small detail after being so close to sucess. E'enin orts is guid mornins' fother. Today’s rain is tomorrow’s whisky. Facts is chields that winna ding. Fill fou an haud fou maks a stark man. Gae tae bed wi the lamm an rise wi the laverock. Gie a beggar a bed an, he'll pey ye wi a loose. Give a beggar a bed, and he'll pay you with a louse. Gie yer purse tae yer wife an ye micht as weel gie her yer breeks an aw. Let your wife control the money and she'll control everyting else as well. Gie yer tongue mair halidays nor yer heid. Give your tongue more holidays than your head. Guid gear gangs intae wee bouk. A capable person is often small in stature. He shoud hae a hale powe that caws his neebour neetie nou. He that's angry appens his mou an steeks his een. The angry man speaks unadvisedly, without investigating the matter. He that blaws in stour fills his ain een. He who stirs up trouble finds himself in it. He that eats but ae dish seendle needs the doctor. Overeating leads to ill health. tak up a beetle an ding oot his harns. He who gives all his possessions to his children should have his brains bashed in. He that's scant o braith shoudna meddle wi the chanter. Never begin anything for which you have no aptitude. He that sleeps wi dugs maun rise wi flaes. He who keeps bad company will be the worse for it. He that will til Cupar maun til Cupar. A hungry person requires no relish to add to the tatse of food. Ilk blad o girse keeps its ain dew. People act more confidently in their own surroundings. It's a bare muir that ye gang throu an no find a heather cou. It's a blate cheetie that maks a prood moose. It's an ill bird that fyles it's ain nest. Don’t foul your own nest. It's better tae hear the laverock sing nor the moose cheep. The outdoor life is the better. It's guid tae begin weel, but better tae end weel. It's ill bringin but, whit's no ben. It's like butter in the black dug's hause. It's no the rummlin cairt that faws ower the brae. It's not the likeliest person who dies first. It's past joukin whan the heid's aff. It's too late to lock the stable door after the horse has bolted. Keep yer ain fish-guts tae yer ain seamaws. Kinnle a caunle at baith ends, an it'll suin be duin. Go to bed late and rise early, and you'll soon be dead. Lat the belled wether brak the snaw. Tried leaders are best in emergencies. 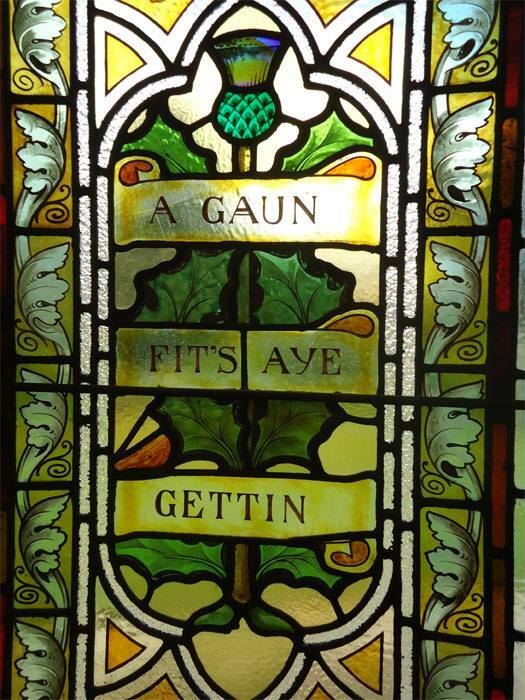 Lig the heid o the sou til the tail o the gryce. Mony ane for laund, taks a fuil by the haund. Mony a puckle maks a muckle. Moyen dis muckle but money dis mair. Influence can achieve a lot but money achieves more. Muckle whistlin for little redd laund. Much cry for little wool. Nae gairdener iver lichtlied his ain leeks. No man speaks ill of what he values most. Ne'er find faut wi ma shuin unless ye pey ma souter. Don't criticise something you know nothing about and which is none of your business. Ne'er gang til the deil wi a dishcloot on yer heid. As well be hanged for a sheep as a lamb. In for a penny, in for a pound. Ne'er lat yer feet rin faster nor yer shuin. Ne'er lat yer gear owergang ye. Pride not yourself in your riches. Ne'er pit yer haund oot faurer nor yer sleeve will rax. Spend no more than you can afford. Niver cast a cloot till mey be oot. Don't dispense with winter cloting until the hawthorn blossoms. Niver tak a forehaimer tae brak an egg (whan ye can dae't wi the back o a knife). To crack a nut with a sledgehammer. Oot the hie-gate is aye fair play. Pit twa pennies in a pootch, an thay'll creep thegither. Put two pennies in a purse, and they will creep together. Raise nae mair deils nor ye can lig. Don't start anything you can't stop. Reek follaes the fairest; beir witness tae the creuk. Excellence is accompanied by envy. Set a stoot hert til a stey brae. The harder the task, the more determination is needed. 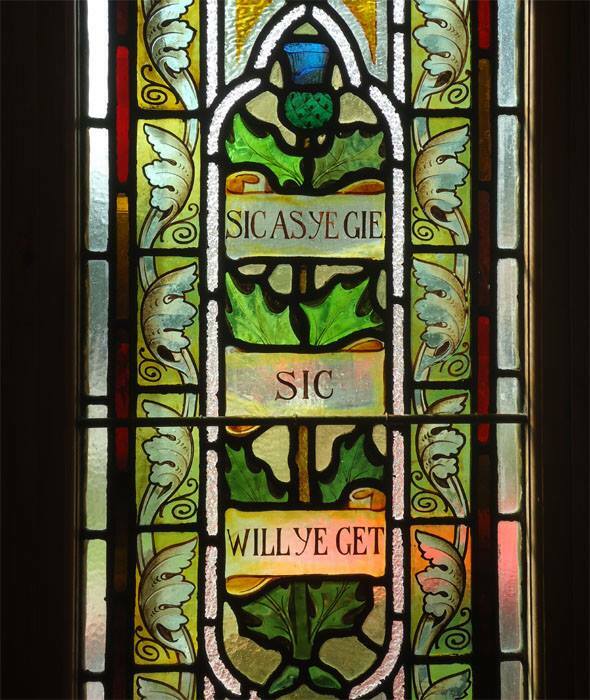 Sic as ye gie sic will ye get. You'll get out of life as much as you put in. Tak help at yer elbucks. Thare belangs mair tae a bed nor fower bare legs. There's more to marriage than laying together in bed. Thare's a dub at ilka door. There's a skeleton in every cupboard. Thare's aye some watter whaur the stirkie drouns. Thay are fremmit freends that canna be fasht. They are strange friends who can't be bothered. Thay gang faur that disna meet ae day. The eemock bites sairer nor the clock. It is dangerous to interfere with a man seriously engaged in business. The keeng ligs doun an the warld rins roond. The pruif o the pudden's in the preein o't. The thing that's duin is no tae dae. We can shape wir bairn's wyliecoat but canna shape thair weird. We can shape our children's clothes but not their fate. Ye canna expect ocht oot a sou but a grunt. A base person will always act basely. Ye canna gaither berries aff a whinbuss. Don't go to ill-tempered people for favours. Ye canna pit a young heid on auld shouders. Its impossible to give the young the wisdom of the old.